VMware vSphere ESXi 6.5 is here and while you should wait to upgrade your production, it's time to explore the new features in your Homelab. I've received a few questions on whether it is safe to upgrade. The ESXi 6.5 stock image can be installed without any issues on 5th Gen and 6th Gen NUCs including the latest i7 Skull Canyon. Drivers for all onboard NICs (I218-LM, I219-LM and I219-V) are available in the stock image. Drivers for NVMe devices and any SATA AHCI controllers are also available without any customizations. Upgrade from ESXi 6.5 Beta to ESXi 6.5 GA? Yes, it is possible to upgrade from beta versions to the final release, but it is not supported. VMware recommends to do a fresh install. ANA chance ti bave on 4th generation or nuc ? Not sure about the 4th Gen NUC because I dont have them anymore. Can you do a quick PCI ID lookup and post the output? So you don't need any additional drivers. This update process preserve image profile: (Updated) ESXi-6.0.0-20160302001-standard (VMware, Inc.) for my ESXi host. Should I do esxcli software profile install --depot=/vmfs/volumes/[DATASTORE]/VMware-ESXi-6.5.0-4564106-depot.zip --profile=ESXi-6.5.0-4564106-standard and then reinstall vibs for the network cards? Drivers for additional onboard NICs from 5th end 6th Gen NUCs are not required. So is the VM6.5 support the usb 3.1 directly without problem ? And can you passthrough a keyboard or mouse in 6.5 ? As previous released it never work without a dedicated usb add-on card, pass to the vm. I've updated my Nuc to 6.5 without problems !! very good ! Only a question... where is the setting for VM autostart ? 2. Virtual Machines > Right-Click Columns > Select Columns > Activate "Autostart Order, Start Delay, Stop Delay"
Thanks so much, to complete the informations.. Inside this backup there's a VM that i need to recover.. Someone know if it's possible to do it without recover all esxi disk ? Any idea how the licensing is going to play out with 6.5? With previous versions you could remove the eval license and keep using it forever, but the eval license for 6.5 is built in, so I wonder what will happen 60 days from now. You can still get a free license for 6.5 as explained here. As always, you can't power on virtual machines when the evaluation period is expired. Thanks for the info. I'm going to have to start following your site. I found it through some web searches last week, and it's a great site. I've read about not being able to power on VMs after the eval period, but I've never seen that. Is that with vCSA, or is that related to something else? I've been running a home lab ESXi server for years, and I currently run it at 6.0.2, and both that and 5.x ran in a "runs forever" mode, where everything works on a single host. I don't have vCSA, but with a solo hypervisor host, I don't need that; is the "can't power on" limitation in vCSA? It seems network card not supported. DHCP did not get IP. Static IP not working (cannot connect from remote server). Installer does not found SSD disk. And now installer recognize my SSD disk and ESXi works fine. for being able to run MacOS in a VM as well. Might be worth a try uninstalling that first. Will post a follow-up! in the meantime I just upgraded via VMware online depot and everything is fine. Intel Nuc 6i7 works with esxi 6.5. But after update there is no Bluetoothadapter found, and there are some usb passthrough Problems. But after update there is no Bluetoothadapter found, and there are some usb passthrough Problems." Hi, I also can confirm that no Bluetooth adapter was found on my Intel 8260. I did discover that I could passthrough the onboard GPU (Iris Pro Graphics 580)to Windows 10 64bit but, even though the graphics driver installed OK, so far I can't get any screen to function on any port. Interestingly, Quicksync is working fine as I ran a few Handbrake encodes with Quicksync enabled that ran VERY well. My Intel NUC6i5SYH with ESXi 6.5 only 100mbit uplink on #Ubiquiti EdgeSwitch. Whats wrong ? Transport (VMDB) error -45: Failed to connect to peer process. Do all VMs have the same problem, or just one? Check vmware.log in the VM directory and /var/log/vmkernel.log for errors. I tried to install 6.5 stock on my NUC5i3RYH. After I tell it to install to the SSD I get "errno 3: No such process" and that the system is waiting for the installation to begin. Any ideas? I'm not finding any hints anywhere. From what is said on the page here there should be no issue with the stock image without any special changes. Maybe I'm doing something wrong? I've tried using both legacy boot and UEFI boot on the DVD with no success. It's really odd because I was able to install from exactly he same DVD (in the same USB drive) on my NUC5i7RYH just a week before. Both NUCs are even sporting the same 500GB Samsung Evo 850 SATA SSD. The one thing I hadn't tried was checking the bios for an update. Sure enough I had version 0130 Dec 2014, and 0361 is the newest version from Dec 2016. I updated and the installer proceeded without any trouble. Thanks for the tip. I've upgraded to the December firmware and the installation is now working. Same problem, same solution. Thank you !!! I just got the latest version that has a SD card. Do you have any help getting this working or the M.2 ? The SD card does not work with ESXi. The M.2 slot (NVMe or AHCI) should work without problems. its compatible with intel NUC Intel NUC 5CPYH, low price. Hello I also have this NUc myself but I cannot install Wifi on it. anybody with a solution to have WIFIadapter of the NUC recognized by ESXi? I installed 6.5 ESXi at Asrock J3455 ITX. There is "no network adapter" problem ;), but you can resolve it with "ESXi-Customizer"
Price is less then NUC. Driver works great. i have a different cosmetic issue. when directly connected to esx, i can configure an intel nic to the vswitch , but not the usb nic. thought to check and see if anyone has seen this. I am debating if i should spend more and go a generation older to get the NUC5i5MYHE to get Vpro. Vpro is nearly a must have and I am thinking it might be worth going older and slower (and more money) to get it. Anyone have any opinion? I just installed 6.5 on a new NUC6i5SYH which has a 275gb crucial m.2 ssd. it installed fine and seemed to install at normal speeds. now though its horribly slow, something is up with either the ssd or drivers or something. i tried to upload an iso and it took forever, max i could get was like 20mbit. i assumed it was an issue with http upload to the datastore. but now i am trying to install the OS (window 2012 r2) and its taking forever at getting files ready for installation. i am seeing extremely high latency and max speeds of around 5MB/s with the latency constantly over 100ms (way too high for an ssd). I dont know if its my nuc, my ssd, or 6.5 issue. I will start diagnosing one by one. anyone else have this kind of issue with m.2 ssd with 6.5 on nuc6i5? 6.5.0 on NUC6i5SYH does not install, probably due to HD driver incompatibility but 6.0.0 works fine. I am installing 6.5 downloaded from my VMUG EVALExperience account on a Skull Canyon NUC6i7KYK on a SANDisk Ultra Flair USB3.0. When booting up ESXi 6.5 I am receiving "Error loading /onetime.tgz"
Fatal error: 15 (Not found). I have disabled all the required settings as per recommendations here. Has anyone encountered this issue before? This error is usually caused by problems with the flash drive or iso file. Download the ISO again and try another usb flash drive. Unfortunately, I do not get to install ESXI on the INTEL NUC: NUC6i5SYH with a Samsung SM951 M.2 MSATA 256GB HIGH SP. The installation will stay at 9% what can I do? If I install ESXI on a 2.5 inch ssd then the installation goes smoothly. 20170711, Thank you for posting this very useful information. 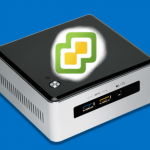 Have you tried VMware ESXi 6.5 on the NUC797BNH and/or NUC797BNHX1? These use i7-7567u CPU and may have newer hardware for Wi-Fi and storage, board, and ports. Looking for answers if the drivers you mentioned will still work automatically with the VMware ISO install? Thank you for any accurate reply. It requires a customized ISO. I'm getting an "Error loading /onetime.tgz" after installation and removal of the USB drive, when booting from the SSD. Anyone know what causes this? I should mention - this is a skull canyon device. Trying to install via the online depot, the update option fails to make any changes. Changing this to "install" throws a warning that it will replace two VIBs, specifically 'VFrontDe_bootbank_sata-xahci_1.28-1' & 'VMware_bootbank_lsu-lsi-mptsas-plugin_1.0.0-1vmw.600.0.0.2494585'. These are the custom drivers I needed to install when first setting this machine up. Is there an issue with overwriting? Based on your article, I am assuming no but am hesitant to proceed. Thoughts? Are there other drivers that you've replaced beside the vFront xahci package? The xahci package is no longer required in ESXi 6.5. Also, if you Update to ESXi 6.5 U1, all NUC NICs are included. It should be safe to remove those drivers. If anything goes wrong, you can revert to the previous version as explained here: https://kb.vmware.com/kb/1033604 (Requires physical access). Thanks for the response! I just finished updating. Everything went well. Nice to see VMware embracing the home lab side a bit. I need some help with my NUC ESXi 6.5 issue. I have a Skull Canyon and I am running 6.5 Well, but I needed another nic and got one of the mentioned usb3 nics for the NUC. I downloaded William Lam's driver and had no problem installing it. However when using it, after a period of time. The nic goes dead!! Even when ESXi reports it functioning, I am not able to use it. The only way to bring the USB3 nic back up is to shutdown everything and power cycle it back up. I tried an alternate driver using the same chipset and still the same issue. I thought that the USB was being powered down, but the BIOS is not using any sleep mode or power down modes. I am at my wits on this one and any help would be appreciated. I have a problem with the upgrade from 6.0 to 6.5. For what is the placeholder(?) ESXi-6.5.0-4564106-standard? apologies if the question has been posted before. Problem: after adding the NUC host to vDS the Management Network randomly disconnects and iSCSI adapter goes offline. Has anyone seen this behaviour? can anyone help? I literally cannot run my homelab..